© 2002 Matula Masonry - All Material On This Website Is The Property Of Matula Masonry. Matula Masonry - High Quality Brick Masonry, Stone Masonry, And Block Masonry In South Mississippi. 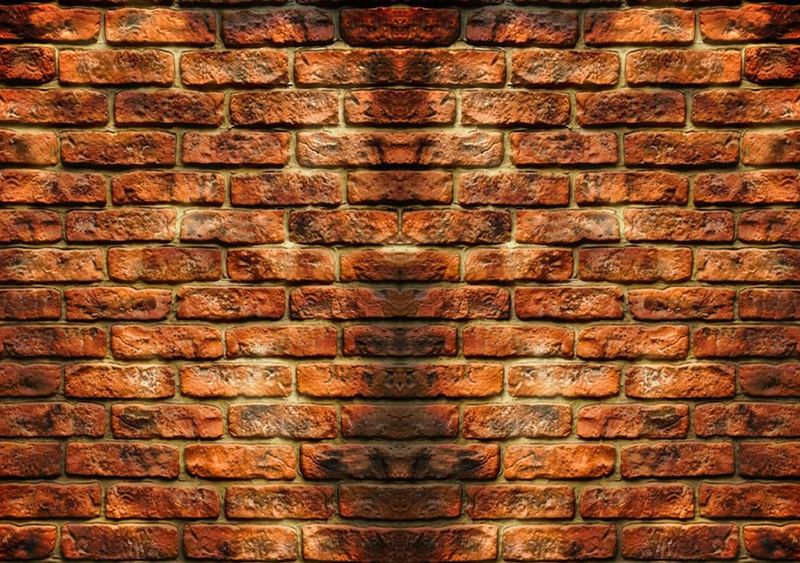 Brick, Stone, Block, Mason, Masons, Masonry, Cement, Repairs, Entrance Ways, Walkways, Stairs, Steps, Porches, Decks, Patios, Driveways, Fireplaces, Hearths, Mantels, Mailbox, Mailboxes, Chimneys, Walls, Fencing, Flower Beds, Garden Beds, Landscape Designs, Patios, Porches, Retaining Walls, Retainer Walls, Stone Facings, Brick Under Skirting, Decorative, Flagstone, Cobblestones, Antique Bricks, Brick, Bricks , Cobblestones, Concrete , Decks, Decorative Concrete, Driveways, Fireplaces, Hearths, Flagstone , Imitation Brick, Manufactured Stone, Masonry Ovens, Natural Stone, Paths, Walkways, Pavers, Paving Stones, Play Areas, Ponds, Pool Decks, Recycled Bricks, Retaining Walls, Sand, Gravel, Sidewalks, Stairs, Steps, Stone , Terraces, Tile , Mason, Masonry, Block, Brick Mason, Stone Mason, Block Mason, Landscaping, Edgings, Borders, Garden Beds, Wishing Wells, Mailboxes, Mailbox, Flower Beds, Gardening, Brick, Block, Stone, House, Houses, Residential, Commercial, Business, Work, Construction, Build, Repair, Brick, Block, Stone, Low Cost, High Quality, Brick, Stone, Block. Mississippi Masonry, South Mississippi Gulf Coast Masonry, Mississippi Bricklayer, Mississippi Brick, Mississippi Block, Mississippi Stone, Gulfport Mississippi Masonry, Biloxi Mississippi Masonry, Ocean Springs Mississippi Brick, Wiggins Mississippi Brick, Pass Christian Mississippi Block, Long Beach Mississippi Block, Perkinston Mississippi Stone, Picayune Mississippi Stone, Waveland Mississippi Mason, Bay St, Louis Mississippi Mason. 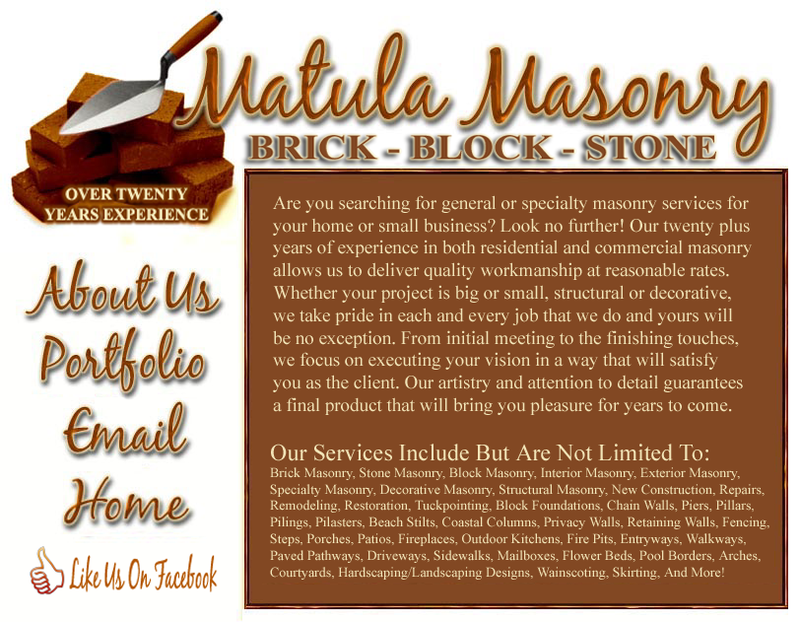 Matula Masonry - High Quality Brick Masonry, Stone Masonry, And Block Masonry. Interior Masonry, Exterior Masonry, Specialty Masonry, Decorative Masonry, Structural Masonry, New Construction, Repairs, Remodeling, Restoration, Tuckpointing, Block Foundations, Chain Walls, Piers, Pillars, Pilings, Pilasters, Beach Stilts, Coastal Columns, Privacy Walls, Retaining Walls, Fencing, Steps, Porches, Patios, Fireplaces, Outdoor Kitchens, Fire Pits, Entryways, Paved Pathways, Walkways, Driveways, Sidewalks, Mailboxes, Flower Beds, Pool Borders, Courtyards, Arches, Hardscaping, Landscaping Designs, Wainscoting, Skirting, And So Much More! Matula Masonry - High Quality Brick Masonry, Stone Masonry, And Block Masonry In South Mississippi.